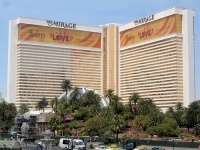 Another MGM mega-casino, the showpiece at the Mirage is a volcano that shoots flames 100 feet (30m) into the night sky every 15 minutes (6pm to midnight), spewing smoke and transforming a tranquil waterfall into spectacular streams of molten lava. As you'd expect of Las Vegas, it's all quite kitsch, but great entertainment. Siegfried & Roy's White Tigers used to be one of the Mirage's signature attractions, but the show was cancelled in 2003 after Roy Horn was attacked by one of the tigers during a show. At any given time. However, there are a number of outrageous attractions at the casino. A popular feature is the aquarium located behind the Front Desk. This 20,000-gallon saltwater aquarium is home to angelfish, puffer fish, tangs, sharks and other exotic sea creatures.